We recently started a new project and as with most new web projects, we needed a new logo. We’ve used sites like 99designs.com and hatchwise.com in the past but had limited success and the price can be a bit high. So this time we decided to come up with something a little different. If you haven’t used fiverr.com yet, be warned… it can be addicting. Essentially, the purpose of the site is that people will do just about anything (literally) for $5. It really is amazing the things you can get for a measly five bucks. 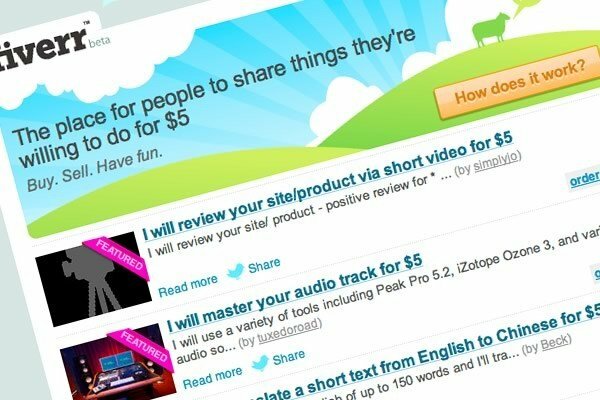 If you arrived on this page because you were looking for the actual Fiverr logo, then look no further. That information is found here. We decided to go through and find 10 of the top rated Fiverr logo designers. We then looked at what they had for their cheapest offering and went with that as a sort of demonstration of their skills. So instead of investing hundreds of dollars on one of the big logo sites, we’re only putting up $50 total with the hope of getting a good sampling of what is possible with each of these designers. The designers are from all over the world and have at least a 98% satisfaction rating with tons and tons of orders already done. We purchased each one for $5 and submitted the exact same requirements to all of them to see what they come up with. After receiving back all of the results for the initial $5 investment, we then picked a couple that we liked best for revisions. Some of the designers included one revision with the initial price, but for others, it was a paid upgrade to get revisions on the logo. In the end, even with the upgrades, the price came in significantly lower than what we would have paid on one of the larger sites. Should I get a logo on Fiverr? Honestly, the answer is that it depends. If you’re on a budget, our guide above is probably the cheapest way you can get a logo unless you have a cousin that works in graphic design and will do it for free. Aside from the option of using a site like 99designs, there is an alternative option of hiring a professional graphic artist to design your logo for you. Many people find this option to be the best for their business needs because you can work closely with a real person and don’t have to worry about technology and some times time zones causing any issues.